This high-end router for the first time combines two VDSL modems in a single device, providing unbeatable performance on All-IP connections. Load balancing enables you to distribute the data transmission of the various digital applications across all of the available connections, thus maximizing the available bandwidth—ideal for large enterprise scenarios. Additional LTE Advanced as an Internet backup guarantee you uninterrupted availability of mission-critical applications. The LANCOM 1906VA-4G is a top router with two integrated VDSL modems for up to 200 Mbps. And that's not all: Thanks to its SFP port it operates directly at high-speed fiber-optic connections. It also works with any external DSL or cable modem via WAN Ethernet. The additional LTE Advanced modem for 300 Mbps mobile access and featuring two SIM card slots is also ideal for intelligent backup scenarios. The LANCOM 1906VA-4G allows multiple Internet access connections to be operated in parallel, with load balancing ensuring that the available bandwidth is used to maximum effect. With the combined operation of 2x VDSL, fiber optic and dual-SIM cellular communications, it provides unsurpassed availability. The LANCOM 1906VA-4G thus offers the ultimate in future proofing for performance-hungry IT applications and mission-critical installations. The LANCOM 1906VA-4G offers high levels of security. 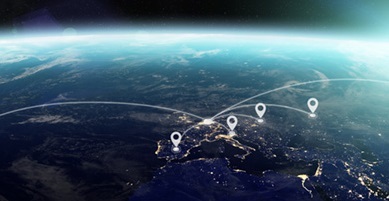 The standard equipment of 25 IPSec VPN channels guarantees strong encryption, secure connections for mobile employees, and protection of corporate data. 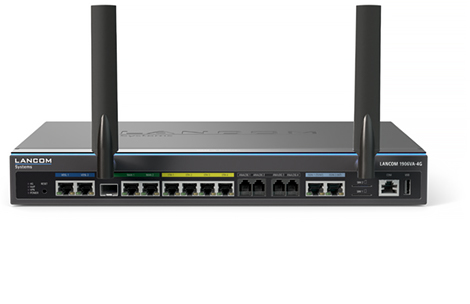 The LANCOM VPN option upgrades the router to support 50 VPN channels. By the way: Our VPN solutions are award winners! 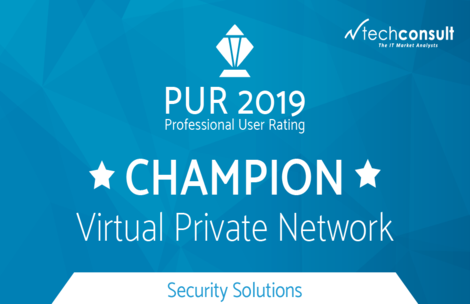 In the techconsult Professional User Rating 2017, they received the “Champion” award in the category “Virtual Private Networks”. The LANCOM 1906VA-4G provides up to 64 securely isolated IP contexts, each of which has its own separate routing. This is an elegant way of operating IP applications with one central router and keeping the different communication channels securely separated from one another. In combination with the LANCOM Management Cloud, the LANCOM 1906VA-4G opens the way for automated management. The software-defined WAN (SD-WAN) enables the automatic setup of secure VPN connections between sites, including network virtualization and backup across the wide-area network: A few mouse clicks is all it takes to enable the VPN function and select the required VLANs for each site. The laborious configuration of individual tunnel endpoints is no longer required at all. 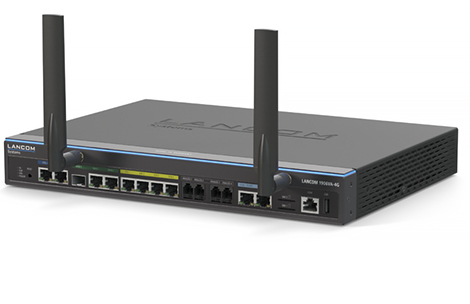 The LANCOM 1906VA-4G translates between ISDN, analog and VoIP. Along with the latest VoIP equipment, you can continue to operate your existing ISDN and analog components without having to replace them. Even after switching to the new All-IP connection, this cost-saving solution conveniently and professionally integrates your ISDN and analog components. It is also possible to operate a combination of analog, ISDN and VoIP PBX devices directly at the LANCOM router. The LANCOM Voice Call Manager is already integrated into the LANCOM 1906VA-4G and provides a wide range of telephony functions. It manages all aspects of the telephony and controls all of the PBX components connected to the router. Furthermore, it enables the easy integration of DECT telephones by autoprovisioning with the LANCOM DECT 510 IP base station. The LANCOM Voice Call Manager provides the functions of a session border controller: This ensures that external (unsecure) and internal (secure) networks are kept separate. Also, voice packets are given preference (Quality of Service) thanks to bandwidth reservation, which ensures a high call quality. In addition, the VCM as a SIP proxy enables the professional management of signaling and voice data for high security in the set up, implementation and teardown of telephone conversations, including any protocol conversion by means of transcoding. The LANCOM 1906VA-4G comes in a high-quality full-metal housing with integrated 230V power supply. Thanks to the mounting system, it is easy to install in a 19" rack—with connection ports redirected to the front, it is quick and easy to work with. Load balancing distributes network data traffic evenly between the Internet connections. This ensures that data links are divided between at least two connections, so that even if one line fails, the other one acts as a backup. Two clients are connected to the Internet via a 1900-series router (2x 100 Mbps VDSL). Both clients are able to communicate with the Internet at the same speed (each at 100 Mbps) as the load balancer integrated into the router evenly distributes the data load between the two VDSL Internet lines (1 & 2). This ensures the maximum utilization of the available 200 Mbps for a significant increase in network efficiency. Equipped with 2 VDSL modems, the 1900-series allows both Internet lines (1 & 2) to be combined into a load-balancer cluster. Apart from providing fair load balancing, the failure of one of the lines causes the other line to take over the data traffic. The additional LTE/4G modem in the LANCOM 1906VA-4G can be used as a backup connection in the event that the physical lines should fail—an ideal solution for maximum availability in mission-critical environments. The integrated load balancer makes it easy to bundle multiple IKEv2 VPN connections into a load-balancing cluster. Be it in combination with a LANCOM router, a central-site VPN gateway, or the innovative LANCOM vRouter: The load of data traffic is more evenly balanced and the system has redundancy. The combination significantly increases the VPN bandwidth available for multiple clients. You can find more information in our KB article. Thanks to the integrated VCM and SBC, the LANCOM 1906VA(-4G) devices are ideal for seamless migration from ISDN/analog to All-IP. SIP lines can be bound to the any of the Internet connections (All-IP line 1 or 2). The load balancer is used to distribute the Internet traffic. Load balancing for the parallel operation of several Internet access connections and maximization of the available bandwidth.